We are a little late in posting this, thanks to all the folks in Richmond who have been working to publicise this letter and this issue. No baseball stadium in Shockoe Bottom!!! We have watched with displeasure the most recent crimes of the Richmond City administration and its petty ambitions; it sells its soul to the rapacious FIRE sector and throws its citizens to the wolves to appease the never-ending greed of its shadowy elite. There is no change in Richmond, only the quiet hum of the Jones Machine and the avaricious stare of the sitting mayor, dancing obediently on the strings of privileged and secret interests. There is no hope in Richmond, only despair for those who remember the lessons of the past. There is no voice in Richmond, only a pathetic handful of ‘local’ media sources who are content to take their pittances from corporate masters while their city rots around them. The corruption leaking from every pore of the city is indicative of its inability to understand or accept its own past. In this city once flourished the most oppressive and disgusting form of business ever created by mankind: the slave trade. Human beings were bought and sold like chattel by the hundreds of thousands based solely on the color of their skin. From Richmond, blacks were shipped all over the country to sweat, bleed, and die at the pleasure of white slave-owners. The scars of this atrocity still bleed and fester in the forms of institutionalized racism and economic apartheid against people of color. For too long Richmond’s elites have systematically manipulated and disenfranchised its black majority through regressive economic policy, criminally negligent spending priorities, mock elections, and shadowy real estate deals. Jackson Ward was obliterated by white elites to make room for an interstate highway. Navy Hill’s earthly remains consist of a marker found in a parking garage by a local professor. The black children of Richmond’s school system suffer from a 75% poverty rate. Black preschoolers attend a program for disadvantaged youth on top of an unlined dump in a school that was built during the era of Jim Crow. Huge swathes of East Broad Street were gentrified to make way for the Richmond Convention Center and CenterStage Theater, a coup for the conspicuous consumers that make up Richmond’s elite patrons and coordinated by Bob Mooney, former chief financier of Richmond-based Ethyl Corp. Monument Avenue’s statuary stands as false exoneration of the ‘heroes’ of the Civil War; ‘heroes’ whose greatest achievement will forever be marked as failing to win the war they fought so desperately to win. Decades ago, the discovery of the Burial Ground for Negroes (now Richmond’s African Burial Ground) by Elizabeth Cann Kambourian under a parking lot in Shockoe Bottom began the decades-long struggle towards the reclamation of the nation’s second-most-successful slave market by the inheritors of its legacy of cruelty and hate. Now, as Richmond’s black residents continue to make progress to regain their past and right the great injustice that white supremacist power has laid upon them, the white land barons have again mobilized to murder the threat of black power in its crib. The specter of the Shockoe Ballpark has been resurrected by Richmond’s criminal capitalist class under the guise of ‘growth’ and ‘wealth.’ The charge is in part led by one H. Louis Salomonsky, an unrepentant capitalist sent to prison several years ago for bribing a public official in a failed bid to swing a mayoral election; his cries of “community!” serve merely to increase the value of his many real estate holdings through wasteful public expenditure projects. His tendrils, and those of others like him, extend far into local politics; the real estate sector outspends the next highest industry in Richmond political campaigns by two to one. We call you out, Dwight Jones. Your 2012 unopposed mayoral election garnered you $314,499 in funds; $43,350 came from the land barons and their interests, with $2,500 alone from Salomonsky and his subsidiaries. Over the course of your sixteen-year political career, the landlords have bribed you for $135,917. We call you out, Charles Samuels. Your 2012 election garnered you $63,225 in funds; $10,850 came from the land barons and their interests. Over the course of your four-year political career, the landlords have bribe you for $24,250. We call you out, Chris Hilbert. Your 2012 election against a neophyte social worker garnered you $41,702 in funds; $5,155 came from the land barons and their interests. Over the course of your eight-year political career, the landlords have bribed you for $43,472. We call you out, Kathy Graziano. Your 2012 election garnered you $96,838 in funds; $12,450 came from the land barons and their interests. Over the course of your eight-year political career, the landlords have bribed you for $71,706. We call you out, Ellen Robertson. Your 2012 unopposed election garnered you $12,110 in funds; $1,000 came from the land barons and their interests. Over the course of your nine-year political career, the landlords have bribed you for $29,525. We call you out, Cynthia Newbille. Your 2012 unopposed election garnered you $17,166 in funds; $1,300 came from the land barons and their interests. Over the course of your three-year political career, the landlords have bribed you for $4,100. We call you out, Reva Trammell. Your 2012 election garnered you $65,141 in funds; $6,645 came from the land barons and their interests. Over the course of your political career, the landlords have bribed you for more than $20,095. We are watching you, Jon Baliles. Bruce Tyler was sold to the landlords for only $82,307. We are watching you, Parker Agelasto. Martin Jewell was sold to the landlords for only $20,600. We are watching you, Michelle Mosby. Douglas Conner was sold to the landlords for only $29,400. We demand that the city permanently halt attempts by its white landowners to build a ballpark in this critically important district and commit fully and transparently to enacting recommendations by the Richmond Trail of Enslaved Africans Commission for a heritage site in Shockoe Bottom. No Stadium in Richmond’s Shockoe Bottom! Defend Richmond’s African History! It looks like Richmond’s business and political elite are about to launch their project to put a baseball stadium in Shockoe Bottom, one of the most important historical sites for people of African descent in all of North America. Please email Mayor Dwight Jones and members of the City Council and tell them we don’t want a stadium in Shockoe Bottom. Use this sample email or make up your own. But please do this right away! City Council will be meeting in a special session Monday, May 6, from noon to 4 pm in the Council Chambers in Richmond City Hall. We think they will be voting on issuing bonds to pay for work in the Bottom to prepare for the stadium. These elected officials need to hear from us now! Will Richmond’s legacy be the desecration of Shockoe Bottom? I understand that Richmond City Council will be discussing capital funding at a special meeting from noon to 4 p.m. on Monday, May 6. You should know that there is strong community opposition to building a baseball stadium on the site of Richmond’s former slave-trading district. No Baseball Stadium in Shockoe Bottom! Defend Richmond’s African History! Forward this email to as many people as you can. Come to the special Richmond City Council meeting on Monday, May 6, from noon to 4 pm. Come for as long as you can, but even a few minutes will help. Read the Spring 2013 edition of The Virginia Defender newspaper to learn more about Shockoe Bottom’s important history. The newspaper will be uploaded this weekend to: http://www.DefendersFJE.org. Reply to this email and tell us if you’d like to help in this important campaign to save Richmond’s African history. Here are 8 new titles in our Wingnut Radical Lending Library. Come to our collective meeting on January 28th if you are interested in joining and helping us organize the library, staff open hours, and organize events and projects as the Wingnut Anarchist Collective! Just cataloguing some books on this rainy day. Here are our newest titles. Thanks to everyone who has donated books to our library! We are always looking for donations specifically around issues of race, class, gender, indigenous struggles, feminism, queer issues, southern issues, anarchism, environmental etc. Black Bloc, White Riot: Antiglobalization and the Genealogy of Dissent by A. K. Thompson (2010). Parents For Life 2012 – Don’t Put Our Babies on the Dump – Protest Tuesday Sept. 4! Tuesday Sept 4th at 5pm, Parents for Life 2012 will be picketing around City Hall, in response to the recent School Board decision to send over 250 pre-k students into an old, unsafe, built on a dump, school that was shut down in 2006. There is a School Board meeting at 7pm that we will be attending as well. On July 18th there was a meeting of a group of people interested in re-forming a Barton Heights Neighborhood Association. The Wingnut Anarchist Collective was concerned by both the small amount of outreach ahead of the meeting, and also the types of decisions on the agenda for the first meeting. We made fliers and notified as many neighbors as we could, but it was not an ideal situation in terms of being able to get word out. Luckily, enough folks did come out who agreed that we needed a much more representative of our neighborhood body to be able to make foundational decision. We filmed the meeting to make it available to folks who could not make it last night. The next event will be a National Night Out Event on August 7th at Yancey Street Park– more info to come on that next week after our planning meeting. The next official meeting of the neighborhood association will be Tuesday September 11th at 6:30 pm, location TBA, but we are looking for one closer to Barton Heights. July 18, 2012 Barton Heights Neighborhood Association Meeting from WingnutAnarchistCollective on Vimeo. We passed out fliers on how Consensus decision making works, and Rusty’s Rules of Order as used by the IWW (Thanks to the Richmond IWW branch for those copies http://www.richmondiww.org). Here are links to those for folks interested in learning about multiple options before we decide on how we as a neighborhood association will be making decisions. We think it is significant/interesting to note, that despite the resistance to using anything other than majority rules voting for decision making at the meeting, that the group actually used consensus to make it’s decisions! This Fall, there will be a 3 part class on Colonization and Decolonization, meeting at the Wingnut Anarchist Collective on Tuesday nights at 8:30pm. Autumn is a season when there are many reminders of colonization and the history of oppression, racism, and genocide that Amerikkka was founded on. From Columbus Day to Thanksgiving there are plenty of celebrations of colonization. 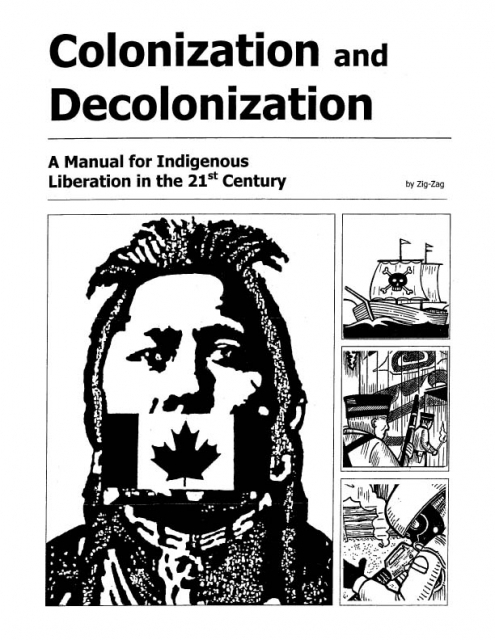 We are choosing to take time to learn more about the real history of colonization and indigenous peoples during this season. We welcome folks with an interest in learning more about these issues to participate in this 3 part class. The meetings will be at 8:30 pm on Tuesday September 20th, Tuesday September 27th, and Tuesday October 4th.